All late invoices will be charged with an additional 5% . Used equipment items are sold with a warranty covering parts & labour, we do not warrant customer miss-use. 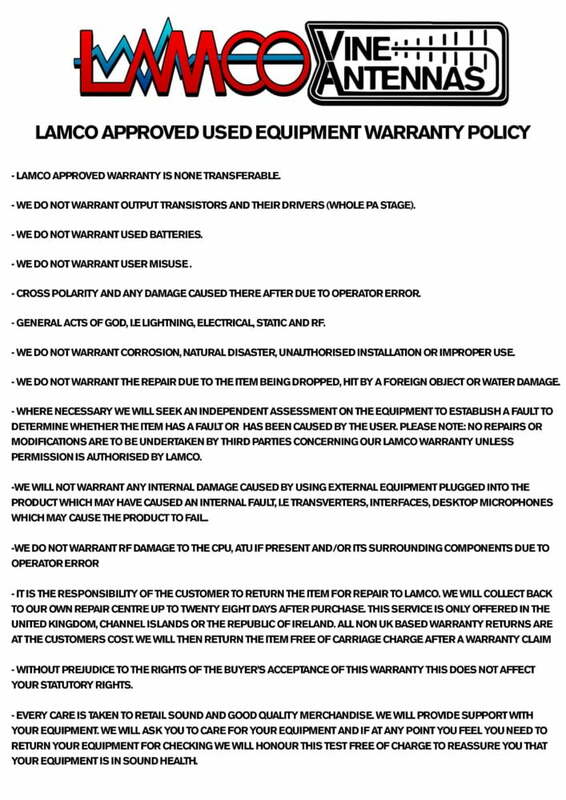 See below LAMCO Approved USED Equipment Warranty. All new equipment is covered by the manufacturers warranty and can be returned direct back to the manufacture. All goods remain the property of LAM Communications Ltd until paid and delivered by LAMCO or either by a third party carrier or delivered to the shop counter signed ‘Click & Collect’. Money has been paid and funds have cleared our bank. ‘Royal Bank of Scotland. Please be aware that we retail on other external platforms and some items maybe out of stock and are undeliverable. In this case we advise you contact our sales office on 01226 361700 before ordering. Export items from the UK that need to be returned for a warranty claim are at the cost of the purchaser. If the item falls outside the warranty claim, a quote will be issued to repair the item and only when payment has been received will any work be carried out on an out of warranty status item. We will then return the item after the warranty claim at our cost. Radio & Linear amplifier output transistors are not warranted. Antennae & relevant apparatus are not warranted against storm damage, protection against these elements is paramount. charge. The item must be returned at the customers expense with all the original packaging & be in as new condition unopened and not used. ‘Still in new condition’. No VAT can be reclaimed on used items charged under the HM Revenue & Customs Margin Scheme. None of our terms will affect your statuary rights. We use a number of different shipping options for making our mail order deliveries. If in the event of damage or missing items you must notify us within one hour of delivery. Next Working Day Delivery by ’12’ Noon Via DPD Local GPS Tracked. Highlands/Islands is a three day delivery. Next working day id during the hours of 8am to 6pm or economy is a three to four day delivery. Where FREE delivery is offered we will ship by the most cost effective means. Orders taken over the weekend are dispatched on a Monday. Orders taken on a Friday before 3pm will be shipped the same day. We offer the facility to part exchange your equipment with ourselves in part payment. In the event of a refund the firm will refund only the paid amount by the customer and the part exchange value will be issued to your account as credit and can be used on a future purchase. At no point will we the firm refund money on the part exchange item. Golden Oldies Junksale USED Clearance. This section of our web site is where we retail our clearance HAM radio equipment. All the Amateur Radio Equipment listed is offered with no warranty, no return, no refund. The items are ‘Sold As Seen’. Where applicable we will identify any known faults and describe to the best our ability any issues, defects or whether the item is offered as for spares and repairs. If you are happy with our statement then please feel free to purchase. E&OE. Rig Cheques are non-transferable and hold no monetary value. Rig Cheques cannot be exchanged or used after the written expiry date. Rig Cheques are only valid as a discount off the final price. Rig Cheques if purchased are non-refundable . LAM Communications Ltd is not responsible for any loss or damage of the Rig Cheque and will not accept any claim for compensation. 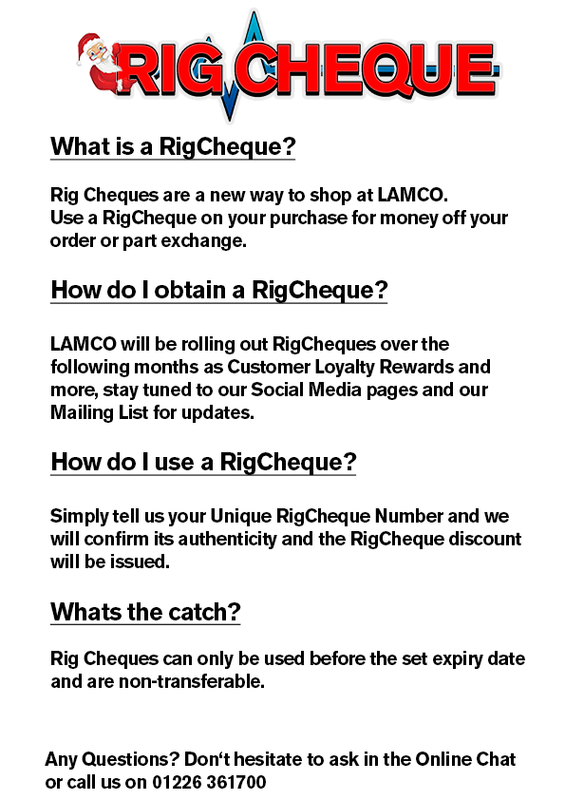 Rig Cheques are deemed void if not validated officially by LAM Communications Ltd. Rig Cheques are limited to one voucher per transaction regardless of value. Rig Cheques are issued at the companies discretion. LAM Communications Ltd reserves the right to amend the terms and conditions herein without prior notice. Please be aware that having your transceiver wide banded enabling a change to the manufacturer’s specification may invalidate your warranty. If you have any questions regarding this notice, please contact Icom UK on 01227 741741.